As scrap metal processors, it’s one of the most frequently asked questions we get asked in the yard. “So what does it mean if it’s ferrous?” Well, the answer is pretty straightforward – today, we’re going to talk about ferrous metals. Ferrous metals and alloys contain iron; non-ferrous materials do not. If the question happens to come up during the Pub Quiz or you happen to be a guest on The Chase, you’re pretty much covered knowing just that. But when faced with just a random bit of scrap metal, it’s actually not so easy to tell if it’s ferrous or not. Luckily, there are several other factors that differentiate the two. Which common items are made from ferrous metals? 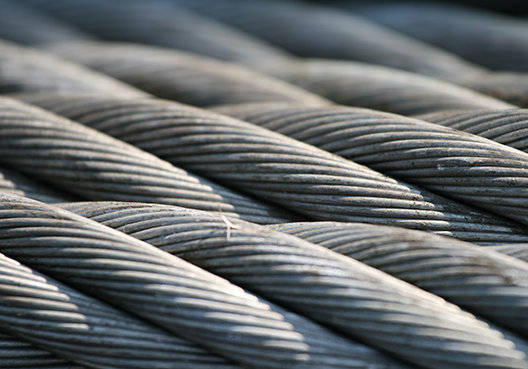 Ferrous metals include mild steel, carbon steel, steel, cast iron, and wrought iron. Think everything from supporting beams and car panels (although not from an Audi or a Jag, they’re aluminium! ), to cutlery and those clunky skillet pans that are so great for cooking a steak. These metals are primarily used for their tensile strength and durability – especially mild steel, which helps hold up the world’s tallest skyscrapers and longest bridges. In 1933, San Francisco’s Golden Gate Bridge took 83,000 tonnes of the stuff to build. If it was built today, it’d only need half of that. You’ll also find ferrous metal in industrial containers, large-scale piping, rails for railroad and transportation, housing construction, plus most of tools and hardware you use around the house. Even a surgeon’s scalpel is made from a tiny sliver of steel. What’s the science behind telling the difference? Due to the high amounts of carbon used when creating them, most ferrous metals are vulnerable to rust when exposed to the elements. While this isn’t true of wrought iron, which is so iron pure that it resists oxidization, or stainless steel, which is protected thanks to its high chromium content, it’s a good rule of thumb that if you see rust, it’s a ferrous metal. Most ferrous metals also have magnetic properties, which makes them very useful in the creation of large motors and electrical appliances. The reason you can tack the kids’ artwork to the fridge using that magnet with the photo from Tenerife 2012? Why ferrous metal, of course. So what’s the big deal, J Davidson? The reason we make such a fuss when it comes to ferrous, is that this type of metal makes up the most recycled group of materials in the world. Did you know that in 2008 alone, 1.3 billion tons of steel were produced, and 500 million tons of that was made from scrap materials? And back in 2006, the steel industry recycled enough steel from scrap cars to produce almost 13.5million new ones. That’s a lot of wheels. For every tonne of steel recycled, we can preserve huge amounts of the Earth’s precious natural resources; 2,500 pounds of iron ore, 1,400 pounds of coal and 120 pounds of limestone. All thanks to fabulous ferrous metals. If you’ve got some ferrous metal that needs recycling, or indeed anything non-ferrous, we’ll take it all off your hands. Give us a call on 0161 928 9981 for a quote or pop down to the yard, where one of Team JD will be only too happy to help.